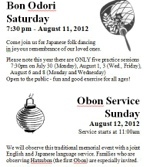 Tonight was practice for Bon Odori festival. Check out the festival in your area. I also suggest reading the sutra that the festival is based upon.